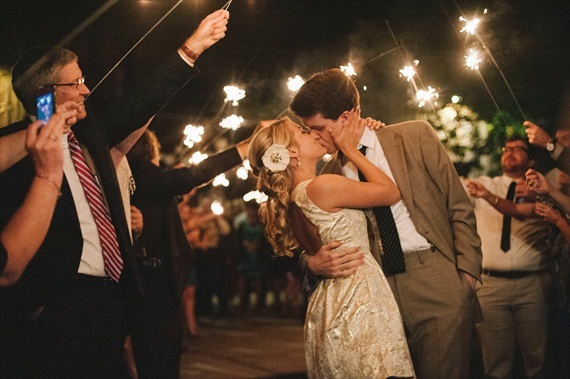 So you have decided to incorporate wedding sparklers for your big day! You will not be disappointed by adding these sparklers to enhance your wedding night. Before you purchase your sparklers online you will want to make sure you have everything prepared and in order. At Grand Wedding Exit, we have compiled a list of the most important things you need to make sure in order to have a sparkling exit. You do not want to overlook these important aspects when planning your wedding sparkler exit. Are Sparklers Legal In Your State? Step one when planning your sparkler exit is to find out if they are legal in your area. This is the most important aspect to manage before you go ahead and purchase sparklers for your wedding. Only a few states do not allow the use of sparklers, but you will want to make sure your area is ok. To make it simple for you we have added a link that shows which states allow the use of sparklers. Once you have found out that these wedding sparklers are legal you can proceed to next part of the checklist. Does Your Venue Allow Wedding Sparklers? Venue approval is perhaps the most important and often overlooked part of using wedding sparklers. Most brides are so excited that they have decided to incorporate sparklers for their wedding that they purchased them before finding out if their venue allows them. When you proceed to ask your venue, make sure to tell them you are purchasing true wedding sparklers that are virtually smokeless and give off no residue. Majority of wedding venues today allow the use of wedding sparklers as the popularity continues to rise. The only time you may run into an issue with the use of sparklers is if your venue is on a historic grounds or in a botanical garden. In most instances, if you are having your wedding in a situation like this they typical have a designated area at the front of the grounds or gate where they allow the use of wedding sparklers. After you have received approval from your wedding venue you will need to go ahead and speak with them to see all of the possible places you can perform your wedding exit. Odds are you will not be their first sparkler exit, so they can absolutely show you where all of the best exits have been performed. How Will You Use Your Wedding Sparklers? Next step in the process is deciding on how to use your wedding sparklers. 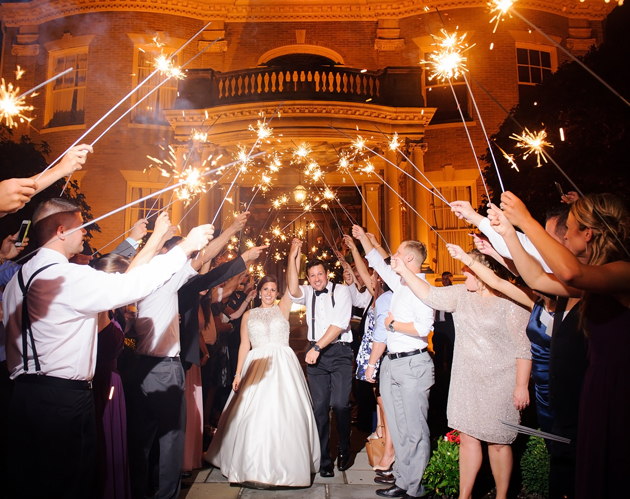 The most popular way to use sparklers is for a grand wedding exit. Grand Wedding Exits takes place at the end of where your wedding guests lineup and have the newlyweds walk through the sparklers in the form of one final celebration. This is a great way to have everyone get together one last time and create some amazing wedding photos. You can choose to use these sparklers a couple different ways as well. Check out our blog on creative ways to use wedding sparklers. Once you have gained approval from your venue and found the perfect spot your next task is figuring out how many wedding sparklers needed. The number of sparklers will greatly depend on a couple important factors. The first is on how you plan on using wedding sparklers? If you are using these for a grand wedding exit then it will be pretty easy to figure out the number of sparklers needed. You will need at least one wedding sparklers per participant so you will just need to refer to your guest list. Please be aware approximately 10% of your wedding party will not stay until the very end of the night so they may miss the sparkling exit. We recommend using a sparkler board or notification so your wedding guests knows to stay until the end of the night to be apart of the sparkling exit! Lighting sparklers can easily be overlooked when planning your sparkler exit, so we wanted to make it a point to help you remember! The best way to light sparklers for weddings is with a barbecue lighter or a butane lighter. Using a typical lighter may prove difficult if it's just a little windy can make the task much tougher. You can also use a candle if you would like which can help speed up the process. It's best to make sure you start the process on both ends of the line to make the lighting go as quick as possible. After you have a couple wedding sparklers lit you can easily touch the lit sparklers with the unlit sparklers. Proper Way To Dispose Wedding Sparklers? Typically this step is forgotten about, but does deserve a moment of your time. After the wedding sparklers go out you will need to find a way to properly dispose them. Just because the sparkler flame has gone out, does not mean they are safe to touch or just toss aside. Make sure your guests do not throw this right away in the trash as they will immediately burn right through plastic and may even start a small fire. If you have decided to use a wedding sparkler bucket to showcase the sparklers you can easily use these again to dispose them. A bucket with sand or water is the perfect way for your wedding guests to easily dispose sparklers. Make sure you have adult supervision at all time with children during and even when the sparklers last spark goes out. You will want to make sure you have items like water, fire extinguishers and first aid kit handy just in case. We consider these last tips super important even if they did not make our vital checklist. We highly encourage a sparkler announcement by the music a couple times throughout the ceremony so your guests know you plan on having a sparkler exit. You will also need your wedding coordinator or close family members to help lineup your guests to help execute a smooth and quick exit. We don't want the newlyweds exiting through sparklers that have gone out! We recommend purchasing 36 inch wedding sparklers due to their extended burn time of over three minutes. These longer sparklers will help ensure your sparkler exit stays sparkling! We hope you enjoyed our Wedding Sparkler Checklist. If you have any further questions about setting up your sparkler exit or any questions reach out to us via email or facebook! At Grand Wedding Exit we stay with you until the final sparkler goes out! Happy wedding planning!